Buy 1 for $16.01Buy 2 / Save $0.85!Buy 3 / Save $3.20! Size (inches): 2.91" X 2.91" X 5.00"
Hippocrates, the Greek Father of Drugs, was known to prescribe apple cider vinegar for its powerful cleaning, rejuvenating and germ battling competencies. TerraVita Premium Collection Apple Cider Vinegar is utilized for weightloss, digestive difficulties, Arthralgia and irritations. Apple Cider Vinegar additionally serves as an outstanding blood thinner, a detoxifier and a diuretic. Assured for Consistent Purity, Effectiveness, Balance and Freshness! Some questions: how does one take apple cider vinegar? By the spoonful, mixed with honey? Before or after a meal? During the day or before retiring to bed? 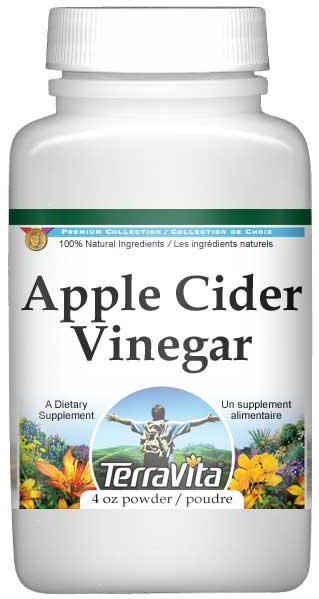 The directions for taking Apple Cider Vinegar Powder are to stir 1/4 of a teaspoon into a glass of water and consume 3 times daily, with meals. Apple Cider Vinegar helps promote weight loss, aids with difficulties in the digestive tract and helps to relieve joint pain.